2000 SF of the best Vermont hardwood maple dance floor in New England. Contra dancing, West African dancing, Afro Caribbean, Techn-Contra, Waltz, Swing. Check out the latest Grange Notes, Project Updates, and other news about the Hall. Flexible, Accessible, Lots of Parking. Rent the Hall for dancing, meetings, family gatherings, performances, trainings, conferences and more. 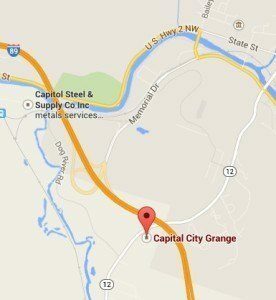 Capital City Grange in Montpelier is located on Northfield Street/Route 12 just south of the I-89 overpass. Click for an interactive map.